1926 Born in Changting,Fujian Province. 1952 Graduated from Taiwan Provinical Normal School Art Department. 1955 Studied modern art painting with Li Chun-shan. 1956 Formed the “Modern Graphic Art Association” with Chin Sung and Yang Yuyu. 1959 Works selected for the exhibition at the “Bienal de Sao Paulo Museu de Arte Modena” in Brazil. 1973 Held a solo exhibition of oil paintings at the “Artists Gallery” in the American Naval Hospital at the Invitation of Mrs.Hua-deng, the wife of the hospital director. 1974 Was awarded the Golden Knight Award by the National Chinese Painting Association. the “Leading Artists of the Modernist Movement” with Shiy De-jinn. 1985 Chiang held a solo exhibition at the Apollo Art Gallery. Exhibition, one painting collected by local art museum. Held a solo exhibition at the “Austrian Museum of Mankind” in Austria. Taiwan Museum of Art collects for the second time the oil painting “Getting Married”. Taiwan Painting Retrospective” to which Chiang is invited. 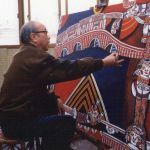 The Taiwan Museum of Art holds the “Chiang Han-tung 70th Anniversary Retrospective” in November. 1999 “Li Chun-shan Teacher and Student Exhibition” is held at the Taiwan Museum of Art. Award, and his works appear in the accompanying exhibition.